Malcolm Gladwell once said one needs at least ten thousand hours of practice to be truly good at something. His examples ranged from Bill Gates to the Beatles. So what does it mean to write for ten thousand hours? Many writers have theorized it is somewhere in the neighborhood of one million words. As I’ve written before, the goal of one million words requires context. I’ve heard writers at a conference tell me they haven’t hit their million words yet, as if it was a homework assignment. Now I do think the one million word mindset is a worthy goal (I’m currently sitting around 360,000 words). But it comes with a few caveats. You need a certain level of humility when you write. You also need to be realistic as you tackle project after project, writing draft after draft. And you need to keep writing, even if your current project falls apart on the last page. A goal of one million words is a good way of accomplishing this, because it gives writers a hard metric to strive for. But you also need to get excited about what you are writing. You need to know if this does work, it’s going to be freakin’ amazing. And that’s where some writers misunderstand about the One Million Word goal. You can write a great book at any time in your writing career. It might be within the first two hundred thousand words, or might end on your seventh million word. But it doesn’t matter if this is your first book or your fiftieth book – you need to keep rewriting and keep pitching to agents. Because even though these don’t add to your word count (unless you count query letters), revising and selling also takes quite a lot of a practice, and the more you do it, the easier it will become. Writing a million words will make you a better writer, but let’s be honest: there is never a point in your writing career where you won’t be focused on learning or improving. 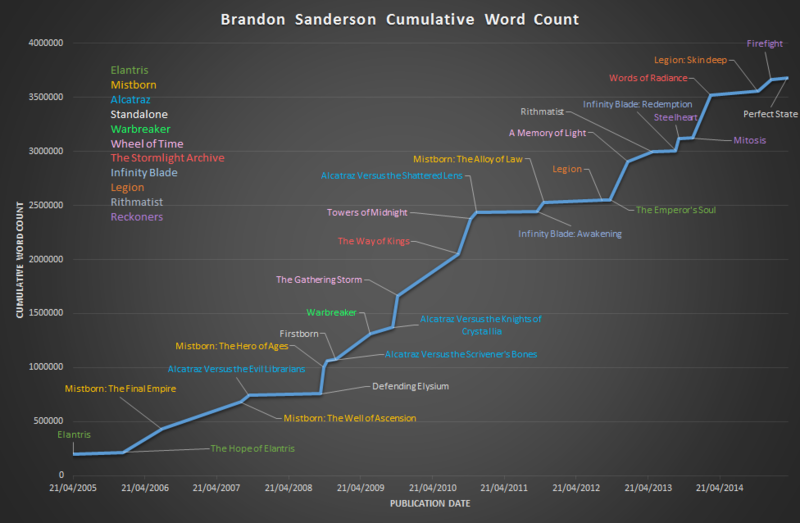 Brandon Sanderson has written more than three times this goal (at least by at the time of this infographic) and yet he’s still working on integrating the lessons of other genres into his own work. Trying to hit one million words is a worthy assignment, but it doesn’t lead to any kind of degree. Instead, it just leads to more lessons and skills on the road to being a better writer.